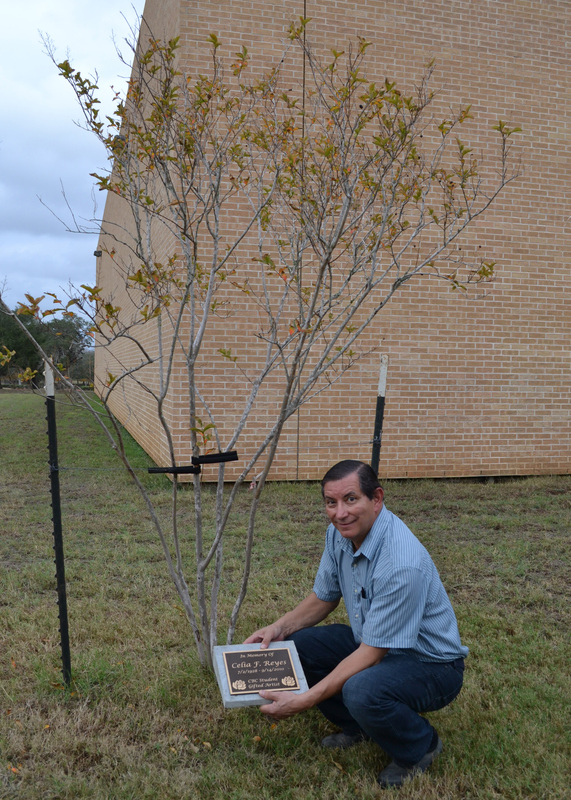 Hector Reyes of Beeville memorialized his mother, Celia F. Reyes, a longtime Beeville resident and artist, with memorial plaque at a tree donated by the Beeville Garden Club on the grounds of Coastal Bend College. He recently visited the college to install a brass and concrete plate at the base of the Crepe Myrtle, which can be seen from several windows in the Frank Jostes Visual Arts Building, where Reyes studied. She was a CBC student and took several art courses under the instruction of the late Simon Michael. She took china painting workshops at the college for more than 20 years. She did not live far from the college and spent many of her days engaged in lifelong learning, her son explained. Reyes was also a member of the garden club and local art guild. She was a member of St. Joseph Catholic Church in Beeville. Reyes died in September 2010. She was married to the late Lucas Reyes for 63 years. Their three children are Joel Reyes of Red Oak, Texas; Alma Reyes of Houston; and Hector Reyes. Alma is a 1976 graduate of Coastal Bend College (then Bee County College).